Zip ties are essential tools when it comes to managing cables (among other things), but it can be difficult to get the ties very tight and/or flush. The best tool for the job is a cable tie gun ($13) that makes it fast and easy to tighten and cut the cable ties flush. Almost all guns tension and cut in one motion, but the best guns, like this Paladin brand gun, also have a tensioning adjustment. This allows the pull of the gun to be set higher before the blades engage to cut off the tie, but not so high the gun breaks the tie. 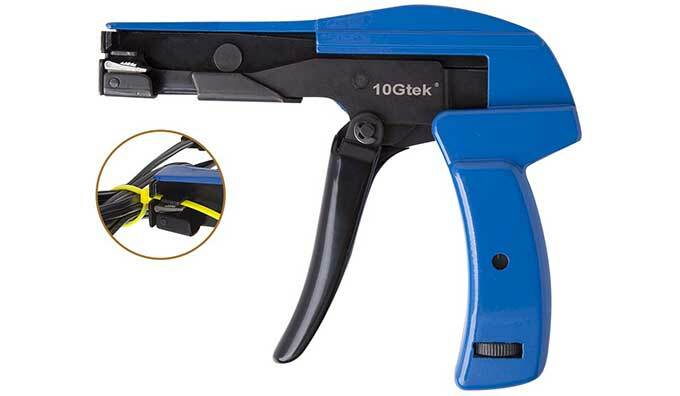 The right tool for tightening cable ties is a “tie wrap” or cable tie gun. You gently tighten the wrap, put the gun over the end of the wrap, and pull – it tensions the tie to the RIGHT level for the size of wrap, and clips off the end.